Spectroscopic Data Relative to Diatomic Molecules provides information pertinent to the electronic spectrum and spectroscopic properties of diatomic molecules. 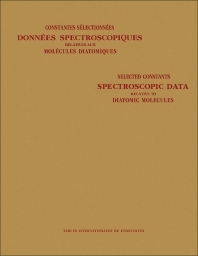 This book consists of a collection of tables that mainly deal with electronic spectra located in the infrared, the visible and the ultraviolet. Thermochemical data have been used in this book to make estimates of dissociation energies while results from electron diffraction experiments have been used to determine internuclear distances. This text provides information regarding potential energy curves, ionization potential, correlations with atomic states, electronic configuration, lifetimes, transition probabilities, astrophysical applications, and chemical physics. This book is a valuable resource for spectroscopists.